The year 2018 has been a year to remember for South Koreans. They watched the historic summit between the two Koreas in April and also saw the minimum wage rise to 7,530 won ($6.73). Unprecedented levels of fine dust put the environmental authorities on alert. But according to Twitter, it was feminism and the #MeToo movement in schools that dominated the national dialogue, at least on the social media platform. On Wednesday, the top 10 most-tweeted social issues in Korea were revealed as follows: School #MeToo, feminism, spycam crime, hatred, Druking, fine dust, the inter-Korean summit, the minimum wage, Hyekyunggung Ms. Kim and local elections. Here are some of the tweets concerning the top three topics. Her post was a response to a movement that hit schools across Korea this year, after a student at Chungbuk Girls’ Middle School in Cheongju took to Twitter on Sept. 7 to complain about the secret filming of a member of a student dance group. 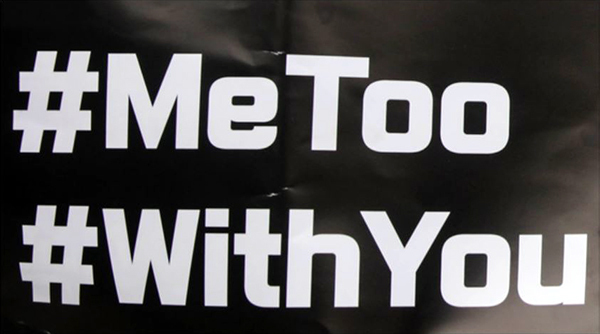 That tweet led a surge in “School #MeToo” tweets from students who shared their experiences of sexual harassment and sexual assault, with over 1.4 million related tweets appearing within the following week. Even as recently as this week, a number of female middle school students in Gwangju filed a report about sexual harassment and assault with the education office. The report alleges that several teachers in Gwangju made “inappropriate contact” with students and targeted them with “degrading remarks.” Police are currently investigating. Last month, four teachers at an all-girls’ high school in Incheon were booked following sexual harassment allegations brought against them by their students. Twitter had no shortage of debate around feminism this year as various issues related to the movement stayed high on the country’s political agenda throughout the year. One trigger was the popular novel “Kim Ji-young, Born 1982,” which had sold more than 1 million copies as of late November. When the news broke that the book would get a film adaptation in September, with actress Jung Yu-mi playing the main character, it was met with both praise and criticism across Twitter. The word “spycam” continued to appear in the headlines throughout the year, after 2017 crime data from police revealed that nearly 17.7 spycam incidents -- called “molka” here, referring to the use of hidden cameras to take pictures or videos for sexual purposes -- had taken place every day. #시선강탈 지하철 계단에 무슨 일이? A tweet from the Seoul Metropolitan Police Agency shows a stairway covered in anti-spycam messages as part of its 2016 campaign. This year saw similar campaigns launched by local police departments across the country. The campaign was endorsed by a group of celebrities, but drew mixed reactions over its effectiveness.